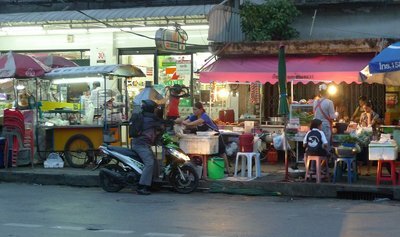 The adventures of an expat American who moved to Bangkok for his husband. While I organize my photos and videos from the US trip, let me post these two tidbits to keep you entertained. The first is a picture of what qualifies as a drive-up window here in Bangkok. A stretch of sidewalk (outside a 7-11, nonetheless!) is filled with vendors selling all manner of food. A man on a motorbike pulls up at the curb, orders something from a vendor, and she packages to go. Two minutes later, he speeds off with his dinner. Can you imagine In-N-Out burger working this quickly? And in the “Thinglish Example of the Day” category, here was the stage backdrop at the recent first anniversary of the Terminal 21 shopping mall. Yes, they are celebrating “NO 1st”. In all fairness, ordinal numbers are confusing and in Thai are no different from cardinal numbers, using only a simple prefix to distinguish them from cardinal numbers. This entry was posted in Uncategorized and tagged tidbits thailand bangkok by christao408. Bookmark the permalink. I wonder how these street stalls claim their territory? There must be some type of protocol (he who shouts the loudest?). 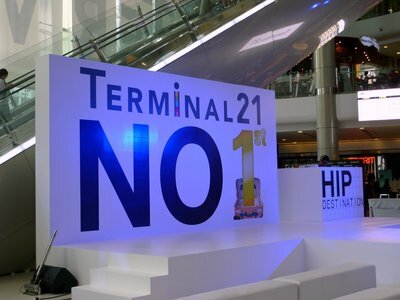 And is Terminal 21 a “Hip Destination”? I hope there is some peaceful means of the stalls claiming their space. Looks interesting though. Some things never change. Just the location and how fast time goes by. It’s pretty hard to learn counting numbers in Thai too, but I realized the pronunciation rhymes with Cantonese Chinese dialect! Burger King should take look at Bangkok’s drive-up service. That said, it does make a difference when the lady wrapping the order is also the owner. haha! Not only quick but the cost is low along with the overhead… The sign made me smile! Now that is what you call fast food. i have yet to visit terminal 21 in bangkok. never had enough free time when i’m there. by the way, looks like you have a secret admirer 🙂 – rabiya. @ElusiveWords – @Fatcat723 – They “rent” them from the local police or district office. @rudyhou – Spammers! Grrrr! @Grannys_Place – At least 25 mph! @murisopsis – Since it is outdoors, you could argue, no overhead! =D@Inciteful – True, I can’t imagine she will be franchising anytime soon. @CurryPuffy – Yes, I think before the Chinese traders arrived, nobody here could count.